Welcome to Nice Lamps. 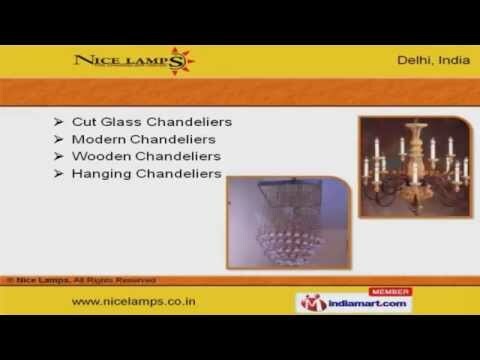 Manufacturer & Supplier of Crystal Glass Chandeliers. Incorporated in the year 1980, we are a client centric organization with immense industry experience and Wide distribution network. Impeccable quality & Easy modes of payment help us to serve Clientele like P.W.D., BSF & PSU. We offer a splendid range of Brass, Ceiling & Designer Chandeliers. Keeping in sync with time, we are able to offer European Style, Royal Pendent & Luxury Ceiling Chandeliers. Our Modern, Wooden & Hanging Chandeliers are in strict adherence with the industry laid norms. Double Height, LED Crystal & Low Height Ceiling Chandeliers are unique in appearance with vibrant colors. Backed by the rich experience and a competent team, we present Middle East Pattern Chandeliers, Table & Pendant Lamps. Our Wall Fixtures, Lamp Shades & Cut Glass Candle Stands are well known for their exotic looks and intricate style.